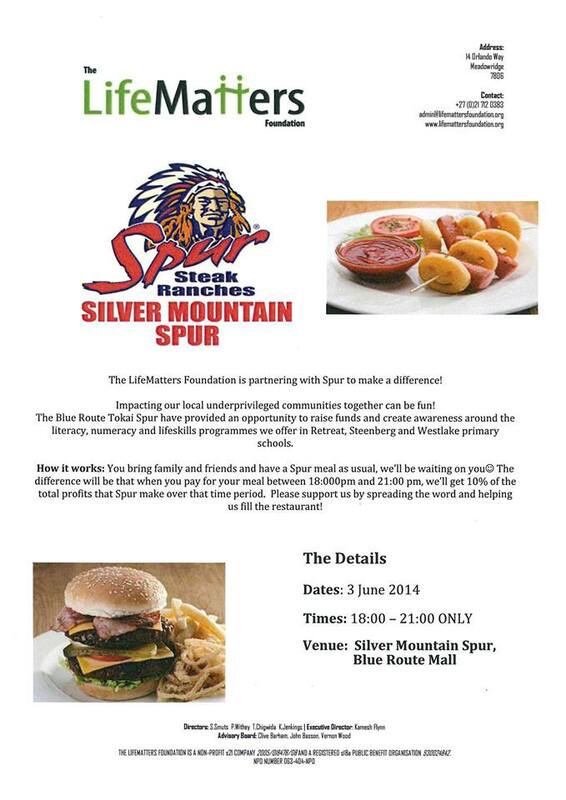 The LifeMatters Foundation is partnering with the Blue Route Tokai Spur to make a difference on the 3 June 2014, from 18:00 – 21:00. A fun event providing the opportunity to raise funds and create awareness around literacy, numeracy and life skills programs offered in Retreat, Steenberg and Westlake Primary Schools. How it works: Bring your friends and family to Spur and enjoy a meal. The difference will be that when you pay for your meal between 18:00 and 21:00, the LifeMatters Foundation will receive 10% of the total profits made over that time period. Support is needed so spread the word and help fill the Silver Mountain Spur!